Current debates on automation, precarity, identity and internationalism would do well to better observe the lessons of labour history. Labour history should be a field in demand. Jeremy Corbyn appears as a possible British Prime Minister, and a growing number of Americans see their salvation in strikes and socialism. Journalists write endlessly about the “white working class,” a force with the power to elect Trump, vote for Brexit, and support a slew of rightist demagogues across Europe. Shelves of books anticipate full automation and the end of work, or the casualisation of work, or the rise of a post capitalist order from within the existing system. These events and trends all have a past, and they can and must be found in the history of work, workers, and their movements. Yet labour history is the subject that dare not speak its name. Unions no longer promote their own history with the old enthusiasm. The men behind New Labour forgot their Party’s past as much as humanly possible, and blundered, as amnesiacs often do, from Iraq to Northern Rock. Marginalised in the academy, senior labour historians anxious to help junior ones advise them to rebrand as a social historian, political historian, economic historian - anything but a labour historian - if they want that elusive permanent job. This abdication leaves the survival of labour history in fewer hands. Small academic societies, such as the Society for the Study of Labour History, hold the fort in the universities. Institutions such as the People’s History Museum still put labour history before the public. Musicians keep the old songs of protest alive, and write new ones. Trade unionists with great passion, few resources, and disparagingly referred to by some academics as amateurs, do the bulk of the work. They have kept the labour movement in touch with its past. The conundrum facing labour history is simple. Its subject matter is so obviously relevant for all those who want to understand how we have reached our current predicament. Its decline as a subject at universities, and among workers themselves, is so obviously due to a long fall in union membership and the crisis of labour and social democratic parties all over the world. Resolving that conundrum will depend on a great many things, the biggest being the revival of organised labour, left-wing success at the ballot box, and greater public attention to the conditions that people face on the job. In the meantime, the way to promote labour history surely lies in using one side of the conundrum against the other: demonstrating its relevance to begin to reverse its decline. Other historians will zero in on other trends, and other examples; the following British and American ones relate most closely to my own work. We live in what seems like a paradox: the “working class” is seldom discussed in the press, except as the object of pity or scorn, yet the “white working class” is everywhere. Trump, Brexit, the rise of “populism” in Europe, are all due to angry whites in hard hats and Hi-Viz jackets. In this reading of recent history, the white working class – ignored, ridiculed, left behind – finally took its revenge on the liberal elites who once patronised it. This story now carries the status of Received Truth, despite its major defects - the main one being that the working class is not just white, nor has it ever been. Black workers were an integral part of the American working class even before the emancipation of the slaves. From the Knights of Labor, the nineteenth-century labour movement, to the Congress of Industrial Organizations of the 1930s, all the great uprisings in American labour history depended on thousands if not millions of black workers. The same was true of Britain. Well before large-scale Commonwealth immigration after the Second World War, the British working class was far from lily white. Black and Asian people have always been a part of the trade unions, Labour and Communist Parties. Shapurji Saklatvala, elected as a Communist MP in the 1920s, was of Indian birth. Even the Chartists, a working-class movement which demanded the democratisation of British life in the 1830s and 1840s, could call on black militants. William Cuffay, a so-called mixed-race tailor from London, paid for his trade unionism and Chartism with a near-life sentence to Tasmania in 1848. This home truth – that whites are not the only “workers,” and non-white people are defined by their class as well as their race – might seem obvious. Yet it cuts across the grain of so much recent political coverage. And even when historians do talk about a “white working class,” they don’t refer to xenophobia in the Rust Belts of the West but to the great expansion of European empires, and areas of European settlement, in the nineteenth and twentieth centuries. If journalists want to use the phrase, they might want to dwell on its imperial origins – and not just on the presumed bigotry of all pale-skinned workers. They might do the same for the immigration debate as well. This is not an area where unions and social democratic parties can always look back with pride. The Australian Labor Party pushed for the aptly-named White Australia policy, and got it in 1901. The American Federation of Labor lobbied for the 1924 Immigration Act: its strict racial and national quotas ensured, among other things, that most Jewish people fleeing Nazi persecution in the 1930s found the American border closed to them. If these lamentable episodes weren’t enough, nineteenth-century labour movements in every English-speaking country, with the partial exception of the UK itself, called for the exclusion of all Chinese (and in some cases all Asian) immigrants. This difficult history seems to fit with the way that the immigration debate is usually phrased: between a xenophobic working class that wishes to simply close the borders, and liberal middle-class types who want to keep them open. There is an element of truth to this picture, but only an element - and they leave out a whole alternative history that runs right through to the present. Some unions, for instance, wanted to regulate immigration rather than restrict it. Trade unionists in the International Workingmen’s Association in the 1860s and 1870s (famous as Marx’s First International), and the American Knights of Labor in the 1880s, were concerned that employers moved workers across borders to break strikes or undermine their closed shop. Rather than simply try to exclude them, both movements sought to build international connections between workers in the same trade, taking in willing recruits from abroad, helping them to build up organisation at home, and therefore (hopefully) avoiding the need for people to migrate for purely economic reasons. Others wanted to do away with borders altogether, or acted as if they didn’t exist. 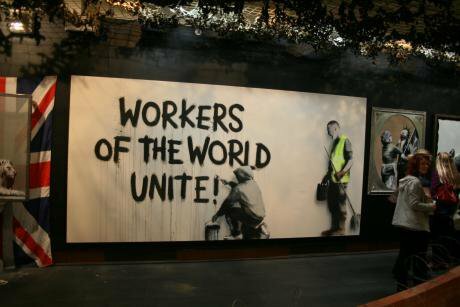 The Industrial Workers of the World, a radical movement that began in the USA in 1905, spread around the world, and still survives today, thought from the beginning that race and nationalism were a kind of bourgeois trick to divide workers from each other. They energetically recruited black and foreign-born workers, both as members and leaders. IWW Local 8, active on the Philadelphia waterfront in the 1910s, was celebrated for the fact that it brought together a workforce one-third black, one-third native-born white, and one-third immigrant – all under the IWW’s best-known black leader, Ben Fletcher. They have parallels today. New unions such as the Independent Workers of Great Britain (IWGB) and United Voices of the World (UVW) reject national chauvinism, and unite immigrant and local workers against some of the most powerful and prestigious institutions in Britain: Uber, Deliveroo, the London School of Economics, the University of London. The point here is that the immigration debate does not necessarily lead to a binary choice between opening and closing the borders, or between internationalism and xenophobia. Labour history is replete with examples where workers “took back control” – but on their own terms, and without always building walls. Its study might also qualify certain shibboleths in the aftermath of Britain’s EU referendum. That vote was cast afterwards as a choice between internationalism or racism – or, more crudely, as smart, enlightened Remainers versus dumb, bigoted Leavers. The official Leave campaigns did, of course, plumb the depths of prejudice as their plan for victory. Yet the statement “the EU equals internationalism” also suffered from severe problems of its own. One is that widespread pro-EU feeling on the left is a recent thing. Conservative splits over Brexit today mirror earlier Labour splits over the Common Market. Racism was not the underlying reason for the hostility of Tony Benn, Michael Foot and many other prominent Labour MPs to what became the EU. They opposed it because they saw it as making socialism in Britain nearly impossible, because of the emphasis always placed by European institutions on free markets. They saw it as undemocratic, with so many powers handed over to unelected bureaucrats and commissioners. They further thought that membership of “Europe” would leave British governments unable to put up barriers, where necessary, to keep factories open and full employment at home. This buried tradition might not appeal to Europhiles. Yet its existence makes a fool out of every demagogue who prefers to place all Leavers in the Boris and Farage camp. Nor is hostility to the EU a peculiarly British trait. Left-wingers in France, for example, successfully led opposition to ratification of the Lisbon Treaty as recently as 2005 (naturally, the treaty went ahead anyway). And the people who equate the EU with internationalism might also want to consider what European unity has often meant in practice. If Europe had a Golden Age of socialism, it was in the years before the First World War, when socialist parties all over Europe began to seriously contend for power and when even their enemies thought they might bring a new social order into being. At congresses of the Socialist (Second) International, speakers continually called for working-class unity all over the world. Yet these congresses consisted almost entirely of European delegates, or delegates of European ancestry, and they repeatedly hedged on what to do about the great European empires: whether future socialist governments should abandon, transform, or retain them. Some delegates even reiterated the racist tropes of their masters – that the colonial peoples were children who must remain under the tutelage of the advanced European peoples. European unity, one kind of internationalism, clashed with a broader, global, anti-imperial kind. Contemporary echoes of that old colonial mindset still exist, whether we consider the damage done to farmers in the Global South by the Common Agricultural Policy, or the construction of Fortress Europe, with its high external borders, as a precondition for “freedom of movement.” Labour history, in other words, complicates comfortable assumptions about the rights and wrongs of Brexit, and the EU itself. Depending on which book you pick up in your local library or bookstore, we live in the age of the precariat, or the end of work, or on the verge of fully-automated luxury communism. Futurism has returned with a vengeance. These works, from Guy Standing’s The Precariat to Paul Mason’s Postcapitalism, all rest on one or more of the following ideas: the end of the old working class, the transformative power of digital technologies, and the rise of automated production. What to make of these claims? History can’t predict the future, but it can caution those who do. John Maynard Keynes, for example, thought in 1930 that higher productivity would, in the not-too-distant future, allow people to work a maximum of 15 hours per week. The world of Star Trek seems to be based on the idea that humans no longer need to work to consume what they wished. The tendency to assume that what is happening now is wholly new has a long history. Take the rise of the precariat, the insecure new social class whose members survive on a diet of casual, short-term contracts. Many studies question the notion that the precariat has devoured the old industrial working class and a layer of formerly middle-class professionals: they claim that its growth has stalled since the 2000s, except in service industries such as education and hospitality. The gig economy has not yet swallowed us all up, nor does it seem likely to do so anytime soon. The historical case is even weaker. Precarious work has been a fact of life for most people in the Global South for the past few centuries, and was indeed the norm for the vast majority of workers in the advanced industrial countries until at least the Second World War. The young mother who now waits on call for a day’s work is the direct descendant of the nineteenth-century prole, hanging around the waterfront for a sliver of waged labour. The same applies to automation. The history of work since the Industrial Revolution is the history of men and women displaced by machines. The railroad brakeman disappeared with the automatic brake, the weaver with the power loom, the carriage maker with the advent of the automobile. The only constant in the history of capitalism is change, and the worker has borne the brunt of it. Current advocates of the idea that robots will soon make us all redundant run up against the fact that automation itself is nothing new. That doesn’t mean that we won’t, at some point, get to a point where old jobs disappear much faster than new ones emerge. That would, as the advocates of “postcapitalism” or “fully-automated luxury communism” suggest, require a new social and economic system. Capitalism is based on the link between wages, prices and profits, none of which would have any meaning in a world without labour and with an abundance of goods. Yet this project will span decades, if not more. In the meantime, we should remain sceptical of the idea that all past trends will soon be irrevocably shattered, whether the shattering will make us jobless or force us all onto zero-hour contracts. And we should also remember that labour movements remain in perpetual crisis. As with automation, as with the precariat – as with all predictions that the world of work will suddenly, dramatically change – we should challenge the idea that the current predicament of organised labour has no precedents. Sure, the signs of crisis are everywhere. Union membership stagnates. The British Trades Union Congress, for example, worries aloud about its failure to recruit young people in large numbers. Historic parties of the left, from the French Socialists to the Greek PASOK, have nearly vanished. Their replacements – Syriza, most tragically – have so far fared little better. But this is not a new story. Arguments that organised labour is in crisis, even doomed, date back to the 1870s at least. The American Knights of Labor attracted nearly a million members by 1886 on the proposition that trade unions had become too weak and too isolated to compete with Big Capital. The US labour movement nearly collapsed in the 1920s, only to revive between the 1930s and 1970s, then fall away again in the 1980s. Yet American unions are still here, however weakened. British trade unions suffered greatly from the depression of the 1870s and 1880s: some larger ones nearly collapsed under the weight of jobless members claiming unemployment benefits out of union funds. Even at the height of its strength, between the 1950s and 1970s, prominent commentators such as Ralph Miliband and Eric Hobsbawm saw a crisis in the British labour movement, and predicted a greater crisis to come. It came in the 1980s – yet British unions are still here. If labour history tells us anything, it says that labour movements never idle along in stasis. If they don’t move forward they retreat. The current crisis might exceed the severity of all previous ones, and labour movements may never recover from it. Yet they might also storm back instead. The recent campaign of Bernie Sanders was a high-water mark in the electoral fortunes of a self-proclaimed American socialist, while British Labour have never had a left-wing leader so close to power as Jeremy Corbyn. Big strikes, such as those by teachers in the US, or university staff from lecturers to cleaners in the UK, still go on. New movements, such as the American Fight for $15 or the London-based IWGB and UVW, still arise. Labour history does not stand in for a crystal ball. Nor is it simply the historical context to our current problems. Labour history encompasses many topics not mentioned here: the gendered division of labour, the co-operative movement, the lives of slave as well as free workers, the poems and novels of working-class writers, the music halls, taverns and clubs where workers passed their leisure time - and much else besides. It is, again, more than just a manual for prospective revolutionaries, union organisers and social-democratic politicians. But it does provide lessons, or at any rate examples to learn from. It does illuminate the forces changing our world. And it does point, however hazily, to possible trends in the future. For these reasons, if no others, we now need labour history more than ever.